First, the picture — from the Bettmann / Corbis archives: the original jazz club Birdland, perhaps on opening night in 1949. 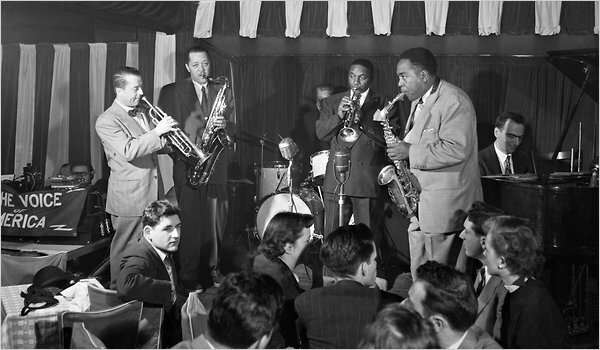 From the left, Max Kaminsky on trumpet, Lester Young on tenor saxophone, a nearly-hidden George Wettling on drums, Hot Lips Page on trumpet, Charlie Parker on alto saxophone, Lennie Tristano on piano. Had he enjoyed a different sort of jazz career, you might say that Ted Brown was finally making a comeback. A tenor saxophonist drawn to a light and lyrically swinging style, Mr. Brown turned 83 last month, with just a handful of albums to his name. For the better part of 30 years, from the early 1960s on, he made his living as a computer programmer. “I’m not good at going out and getting gigs,” he said recently, sounding resigned and matter of fact. By his account his last booking in New York as a bandleader was in 1976 at the short-lived Midtown branch of George Wein’s Storyville club. His next booking is Wednesday night at the Kitano Hotel on Park Avenue, and the circumstances are ripe for his return. Mr. Brown was among the early protégés of Lennie Tristano, a blind pianist and composer who charted his own course through modern postwar jazz before withdrawing into a reclusive life of pedagogy. (He died in 1978.) The music of the Tristano School, as it came to be known, was for many years the province of niche enthusiasts, and only a rare point of reference for musicians in the jazz mainstream. That’s no longer the case, thanks to the ascendant influence of a generation of players — like the saxophonist Mark Turner, 45, and the guitarist Kurt Rosenwinkel, 40 — who have been vocal in their admiration for Tristano’s harmonically daring, melodically intricate music. Greater availability of that music has furthered the cause, as have scholarly examinations like “Lennie Tristano: His Life in Music” (University of Michigan Press), published in 2007. The Tristano School, always ahead of its time, has come to feel congruent with ours, exerting real influence among younger musicians, including some of the brightest and best. Tipped off by an Army acquaintance who had studied with Tristano, Mr. Brown attended a private session and soon became a disciple, joining two other gifted saxophonists: Lee Konitz, who at 83 is among jazz’s great unfaltering elders; and Warne Marsh, who died in 1987. Mr. Brown’s best-circulated recordings were all made with one or the other of these peers. Tristano was an imposingly dexterous pianist with a commitment to contemporary harmony and the forward-skimming melodic line. Born and raised in Chicago, he moved to New York in 1946, when bebop was ascendant. His music resembled bop in its brisk variations on standard themes, but was less rhythmically volatile and more sternly obsessed with pure improvisation. He took part in the New York scene for a while, earning the respect of some prominent critics and musicians — including Charlie Parker and the pianist Billy Taylor, who died last month — but even then Tristano’s primary focus was on developing musical ideas in a workshop setting. “Right at the beginning he told me he didn’t want students who were coming in for a few lessons and popping out on the road,” Mr. Brown said. He remained a student for seven years, helping establish a rehearsal studio above an auto shop at 317 East 32nd Street in Manhattan. The address quickly became the title of a Tristano School anthem. “It’s gotten blown out of proportion,” Mr. Brown said of Tristano’s aloof and imperious reputation. “He was strict, but he also had a very human side.” Yet it’s true that Tristano issued scathing judgments of other musicians, and that he maintained a compulsive control over his music, gradually abandoning live performance for the studio, where he could overdub parts — as on his pioneering, self-titled 1956 Atlantic album — and stamp the output with metronomic precision, often using an actual metronome. Seclusion was one reason for Tristano’s obscurity. Another, more complex, was race. (Mr. Iverson’s essay delves into that issue in detail.) Tristano played with a number of black musicians, but his inner circle was white, as was the perceived affect of his music. “Lennie’s concept was first to get a rhythm section playing very basic, so that what he was doing would be in clear relief,” Mr. Konitz explains in the 2007 book “Lee Konitz: Conversations on the Improviser’s Art” (University of Michigan Press). Given the centrality of dynamic rhythm in jazz, that approach alienated some listeners from Tristano’s music. Because Mr. Turner is one of the most emulated saxophonists of the last 15 years, especially among music students, the Tristano School has seeped into the consciousness of a new generation of players. Some of his colleagues, similarly revered by the conservatory crowd, have intensified the process. Mr. Rosenwinkel, a longtime band mate of Mr. Turner’s, favors the harmonic involution and long, unfurling lines of the Tristano School. The drummer Jorge Rossy, another Tristano enthusiast, was a decadelong member of the extremely influential Brad Mehldau Trio. And of course there’s Mr. Iverson, who like Mr. Mehldau has played occasionally with Mr. Konitz. Among the 20-something pianists who have a clear admiration for Tristano is Dan Tepfer. “There are tracks of his that just can’t be ignored,” Mr. Tepfer said. Two years ago he released an album called “Duos With Lee” (Sunnyside), featuring Mr. Konitz. With two saxophonists closer to his own age, Noah Preminger and Dan Voss, he has played gigs around the city featuring nothing but Tristano School music. For his part Mr. Brown, a profound admirer of Charlie Parker and Lester Young, looks to a more classic mode of interplay. “I always liked the concept of swinging and melody,” he said. One of his best albums, “In Good Company” (Steeplechase), from 1985, features the guitarist Jimmy Raney, the bassist Buster Williams and the drummer Ben Riley: a deeply swinging rhythm team. This entry was posted in Ideal Places, Irreplaceable, Jazz Titans, Pay Attention!, Swing You Cats!, The Heroes Among Us, The Real Thing, The Things We Love and tagged Ben Riley, Ben Van Gelder, Ben Wendel, Billy Taylor, Birdland, Brad Linde, Brad Mehldau, Buster Williams, Charles Ives, Charlie Parker, Conlon Nancarrow, Dan Tepfer, Dan Voss, George Wettling, Herbie Hancock, Hot Lips Page, Jazz Lives, Jeremy Udden, Jimmy Raney, Jorge Rossy, Keith JarrettmEthan Iverson, Kurt rosenwinkel, Lee Konitz, Lena Bloch, Lennie Tristano, Lester Young, Mark Turner, Max Kaminsky, Michael Kanan, Michael Steinman, Nate Chinen, Noah Preminger, Stanley Crouch, Ted Brown, The Bad Plus, The New York Times, Warne Marsh, Wayne Shorter. Bookmark the permalink. I saw one mistake: In Good Company, (including also Hod O’Brien, p.) is recorded and issued by the Dutch label “Criss Cross” (Chriss 1020) at Rudy van Gelder’s. Not on Steeplechase. You had the same thought I did, as soon as I saw that Voice of America banner – this was broadcast, so it was more than likely recorded. Lester, Bird, Lips Page and Lennie Tristano, all on one recording – I must hear it!